It’s the second half of August, and it has occurred to me that rosé season is rapidly coming to a close in Minnesota. Wow, summer goes so fast! Now we need to burn through our remaining rose before the close of the warm weather. We can use a bottle or two at Thanksgiving, but there’s no need for roseˊ in Minnesota once October arrives. Lunch today was going to be a salad with strawberries, chicken, chevre, a salad I really like for warm summer days. While looking through our supplies, I was intrigued by fresh ripe peaches, and some cocktail shrimp we had in the freezer. I thought, why not? 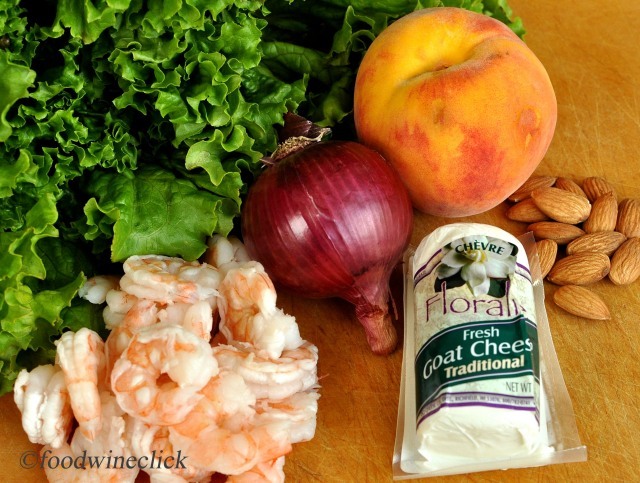 Salad ingredients included a curly leaf green lettuce, cocktail shrimp, a small red onion, a nice ripe peach, almonds, and chevre. Our favorite dressing for a summer salad is a simple balsamic vinegar reduction. It’s full of flavor, and doesn’t add any unnecessary heaviness from oil. There’s no recipe required, simply slice the ingredients in the amount you like, or looks right, and you are ready to eat. I like to have a bit of french bread with my salad, always nice to toast it first. A nice glass of rosé, and you’re all set for lunch! The summer sun is so bright and harsh, I moved lunch into the shade for the photo below. The salad was really nice. I like the combination of something sweet from the fruit, and the ripe peach was great. The fruit was balanced by the other flavors from the greens, the onion, the chevre, and the balsamic vinegar. The almonds add a nice richness and crunch. In this particular case, I didn’t think the shrimp was the best choice. Chicken would have worked a bit better. Oh well, it was really fun to switch ingredients as a test. 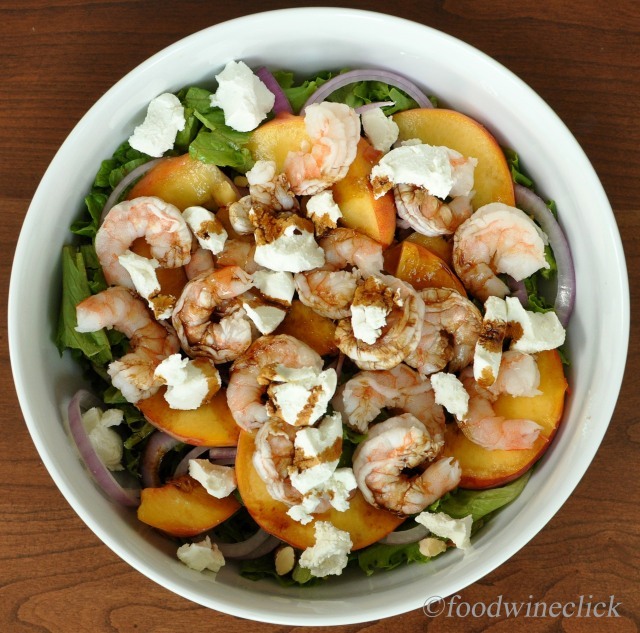 Ripe peaches and chevre in a salad were a great combination! 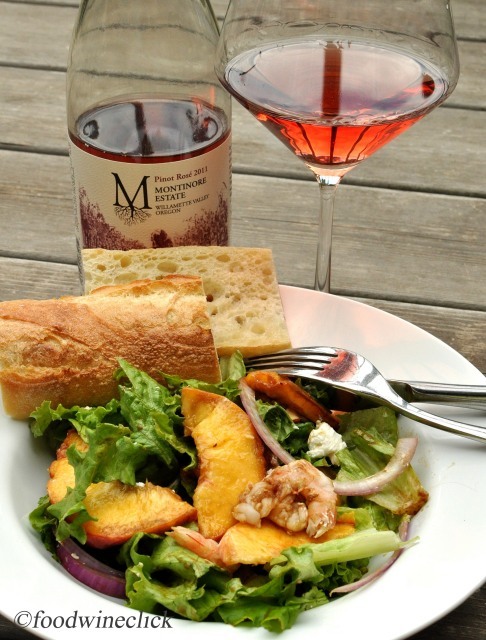 A summertime salad is a perfect match for a nice, dry, crisp rosé. 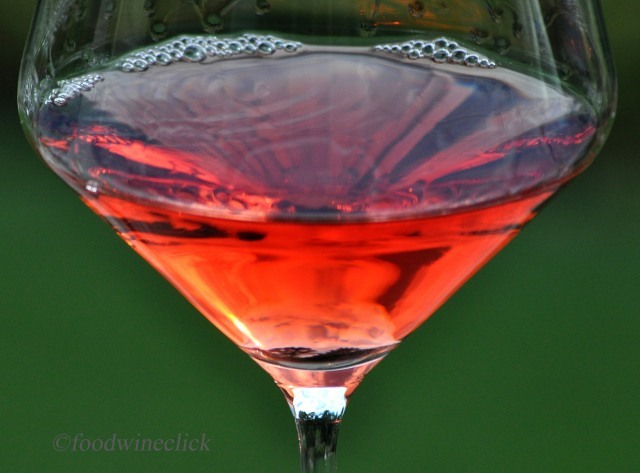 Rosés are always made from red grapes, but they are kept in skin contact for a very short time. They are typically aged in stainless steel, or some other neutral vessel, so they retain their fruit and crisp nature. However, they can can come from almost any red grape. 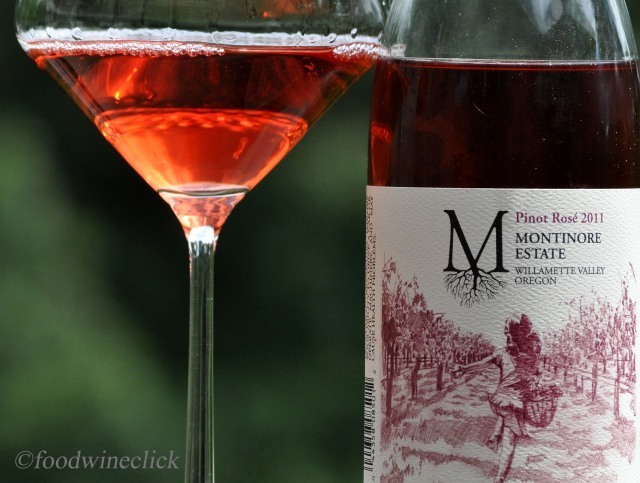 This Pinot Noir Rosé is from Montinore Estate in Oregon. Montinore is pretty big as Oregon wineries go, but they are still a medium size winery in the greater world of American wine. In Minnesota, their Willamette Valley Pinot Noir and Pinot Gris are distributed pretty widely. Both are very nice wines under $20 which I would highly recommend. In addition to making great wines, their whole estate vineyard is run under biodynamic principles. While I’m not sure about all the angles of biodynamics, I do appreciate any vineyard operated in an organic or sustainable fashion, and biodynamics fits that paradigm. Rosé is the official herald of spring for us. The 2011 vintage is a bright salmon color, with a fresh strawberry nose, with hints of dried fruits. 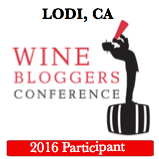 On first sip the palate attacks with raspberry, mouthwatering black cherry, but is smooth with a tight structure. The finish is balanced dry, but fruity. Rosé is perfect for summer, so don’t hold onto this too long. We recommend enjoying this bottle before Labor Day. This rosé has a darker color than most we have had this summer. Drink it by Labor Day. Wow, we just made it!